The genus Cryptosporidium, which is an obligate intracellular parasite, infects various vertebrates and causes a diarrheal disease known as cryptosporidiosis. Bats are naturally infected with zoonotic pathogens; thus, they are potential reservoirs of parasites. We investigated the species and genotype distribution as well as prevalence of Cryptosporidium and Eimeria in Philippine bats. We captured and examined 45 bats; four were positive for Cryptosporidium spp. and seven were positive for Eimeria spp. 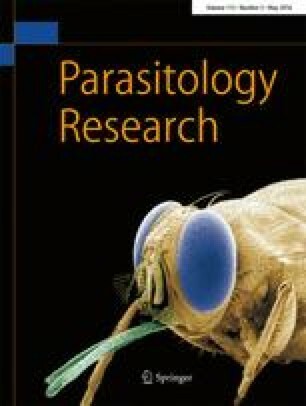 We detected Cryptosporidium bat genotype II from Ptenochirus jagori. Three other Cryptosporidium sequences, detected from Rhinolophus inops, Cynopterus brachyotis, and Eonycteris spelaea, could not be classified as any known species or genotype; we therefore propose the novel genotype Cryptosporidium bat genotypes V, VI, and VII. Bat genotype V is associated with human cryptosporidiosis clade, and therefore, this genotype may be transmissible to humans. Among the Eimeria sequences, BE3 detected from Scotophilus kuhlii was classified with known bat and rodent clades; however, other sequences detected from C. brachyotis, E. spelaea, Rousettus amplexicaudatus, and R. inops could not be classified with known Eimeria species. These isolates might represent a new genotype. Our findings demonstrate that the bats of the Philippines represent a reservoir of multiple Cryptosporidium and Eimeria spp. This study was supported by a JSPS Research Fellowship for Young Scientists, Grants-in-Aid for Young Scientists, Exploratory Research, Scientific Research on Innovative Areas (3308) from the Ministry of Education, Culture, Science, Sports, and Technology (MEXT) of Japan, Bio-oriented Technology Research Advancement Institution (BRAIN), the Program to Disseminate Tenure Tracking System from the Japan Science and Technology Agency (JST), the Akiyama Life Science Foundation, the Kurozumi Medical Foundation, and the Mishima Kaiun Memorial Foundation.